Patra's Other Place: Aussie animal visitors! In the thirty years we have lived in Eltham, we have had quite a variety of animals (other than birds) passing through. Koala (twice), kangaroo (seen once in the front yard briefly), foxes (seen by neighbours), snakes (not seen by us, but one of our cats was bitten), spiders of course (there all the time), and today an Echidna. 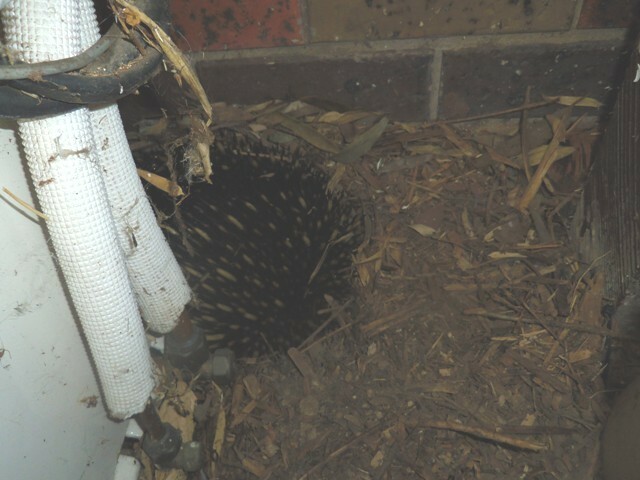 Our neighbours told us last year they saw an echidna in their yard not long after they moved in. I didn't say anything, but wondered if they had seen something else that they mistook for an echidna, as we had never heard of any sightings around here. Well I am happy to be proved wrong in my assumption! Tiger and Topsy had been shut indoors all day while I was out, because the weather forecast was for rain, and both cats hate the rain. When I got home about 5 pm, and opened the back door for them to go out, they refused to go out there, and hung around the front door mewing loudly. 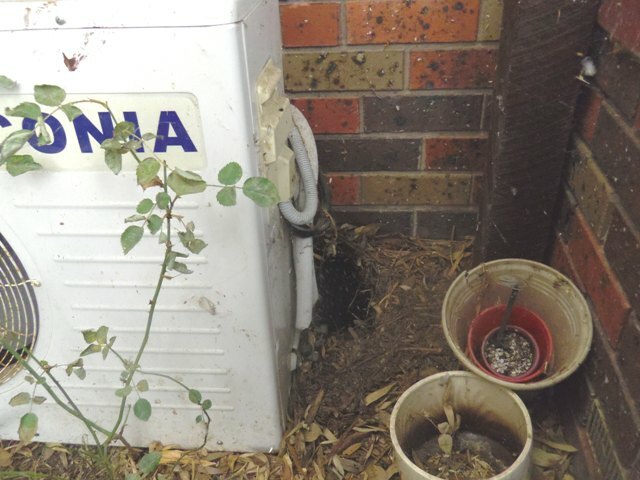 So I opened that door, and they shot out, and went straight to the air conditioning unit which is on the ground behind the front porch. They sniffed around it, approaching it and then backing off. Finally I got a torch to see what the attraction was behind the unit (there is only about 6 inches between it and the wall), thinking it might have been a snake, but no, it was an Echidna. You can just see a bit of him behind the unit here. Here he was trying to bury himself in the ground when I moved the pots to get a better photo. Wedged in behind the air con. unit! I stayed outside on the porch waiting for Ken to come home, and he was as excited as I was when he saw this little creature! 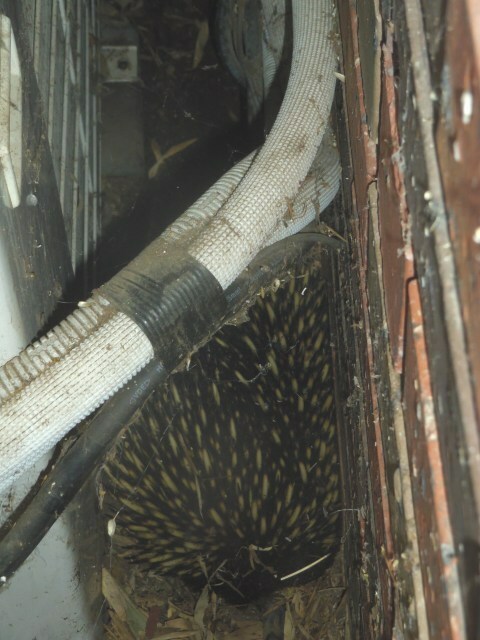 We went inside and came back out an hour later, and the echidna had disappeared. We looked everywhere, but there was no sign of him. Their diet is mostly ants and termites, so we are hoping he stays in our yard, as we had a termite infestation years ago, and if our little friend wants to eat any termites that are around now, we would be very grateful!